Confucius was a Chinese philosopher who was born in 551 B.C. Confucianism, a religion of optimistic humanism, has had a monumental impact upon the life, social structure, and political philosophy of China. The founding of the religion goes back to one man, known as Confucius, born 500 years before Christ. Confucianism deals primarily with moral conduct and ethical living and is often categorized as an ethical system, rather than a religion. It emphasizes the earthly, not the heavenly. "It is not allowed to affirm that Confucius was saved"
Confucius was a Chinese philosopher who was born in 551 B.C. Confucius is a corruption of the name K'ung Fu-tzu. Although K'ung Fu-tzu was the philosopher's correct name, he has historically been referred to as Confucius in Western countries. Confucius is to the Chinese culture and history what Socrates is to the Western culture and history. Both philosophers lived before A.D.
Confucius (551-478 B.C.) is the romanised form of the Chinese name Kong Fuzi (Chinese: 孔夫子; Hanyu pinyin: Kòng Fūzǐ; Wade-Giles: K'ung-fu-tzu). He was a Chinese thinker and social philosopher born in Lu (modern day Shandong province). Confucius is to the Chinese culture and history what Socrates is to the Western culture and history. Both philosophers lived before A.D.
His parents, while not wealthy, belonged to the superior class. His father was a warrior, distinguished no less for his deeds of valor than for his noble ancestry. Confucius was a mere boy when his father died. From childhood he showed a great aptitude for study, and though, in order to support himself and his mother, he had to labor in his early years as a hired servant in a noble family, he managed to find time to pursue his favorite studies. He made such progress that at the age of twenty-two years he opened a school to which many were attracted by the fame of his learning. His ability and faithful service merited for him promotion to the office of minister of justice. Under his wise administration the State attained to a degree of prosperity and moral order that it had never seen before. But through the intrigues of rival states the Marquis of Lu was led to prefer ignoble pleasures to the preservation of good government. Confucius tried by sound advice to bring his liege lord back to the path of duty, but in vain. He thereupon resigned his high position at the cost of personal ease and comfort, and left the state. For thirteen years, accompanied by faithful disciples, he went about from one state to another, seeking a ruler who would give heed to his counsels. Many were the privations he suffered. More than once he ran imminent risk of being waylaid and killed by his enemies, but his courage and confidence in the providential character of his mission never deserted him. At last he returned to Lu, where he spent the last five years of his long life encouraging others to the study and practice of virtue, and edifying all by his noble example. He died in the year 478 B.C., in the seventy-fourth year of his age. His lifetime almost exactly coincided with that of Buddha, who died two years earlier at the age of eighty. "I for my part am not one of those who have innate knowledge. I am simply one who loves the past and who is diligent in investigating it." The religion of Confucianism derives its name from Confucius, and is based on his writings. These writings were intended to be advice for the rulers of China in the sixth century B.C., and were later studied by the followers of Confucius. In addition, his followers brought in ideas originating in Buddhism and Taoism, as Confucianism spread from China to other Asian countries, including Korea, Japan, and Vietnam. One idea emphasized by Confucius was "beautiful conduct." He thought that if everyone in a society could achieve "beautiful conduct," or what he considered correct behavior, society could become perfect. This involved avoiding all extreme actions and emotions, being considerate to others, respecting family and the elderly. The men of old, when they wished their virtues to shine throughout the land, first had to govern their states well. To govern their states well, they first had to establish harmony in their families. To establish harmony in their families, they first had to discipline themselves. To discipline themselves, they first had to set their minds in order. To set their minds in order, they first had to make their purpose sincere. To make their purpose sincere, they first had to extend their knowledge to the utmost. Such knowledge is acquired through a careful investigation of things. For with things investigated knowledge becomes complete. With knowledge complete the purpose becomes sincere. With the purpose sincere the mind is set in order. With the mind set in order there is real self discipline. With real self discipline the family achieves harmony. With harmony in the family the state becomes well governed. With the state well governed there is peace throughout the land. Confucius may not have considered himself to have founded a religion. He was a philosopher, not a prophet, and did not emphasize spirituality, but instead certain behaviors and being a good citizen. He believed that five relationships formed the basis of a stable, happy society. These five relationships include those between ruler and subject, older brother and younger brother, father and son, husband and wife, and the relationship between two friends. After his death, Confucius' grandson and disciples continued spreading his philosophies. Confucius is considered a great teacher, rather than a prophet or god. He is well-known for his sayings, such as "What you do not wish for yourself, do not do to others," and "Respect yourself and others will respect you." Rituals which strengthen the five relationships are important to followers of his teachings. Confucius died in 479 B.C. His hometown of Qufu became well-known after his death, and is now visited by many tourists, as well as Chinese citizens wishing to visit the nearby temples and Confucius' grave. It is unclear whether Confucius would have approved of the many temples dedicated to him, or if he would have wished for his followers to continue with his teaching, and not make him the object of veneration. Confucianism, the philosophical system founded on the teaching of Confucius (551 - 479 BC), dominated Chinese sociopolitical life for most of Chinese history and largely influenced the cultures of Korea, Japan, and Indochina. The Confucian school functioned as a recruiting ground for government positions, which were filled by those scoring highest on examinations in the Confucian classics. It also blended with popular and imported religions and became the vehicle for articulating Chinese mores to the peasants. The school's doctrines supported political authority using the theory of the mandate of heaven. It sought to help the rulers maintain domestic order, preserve tradition, and maintain a constant standard of living for the taxpaying peasants. It trained its adherents in benevolence, traditional rituals, filial piety, loyalty, respect for superiors and for the aged, and principled flexibility in advising rulers. 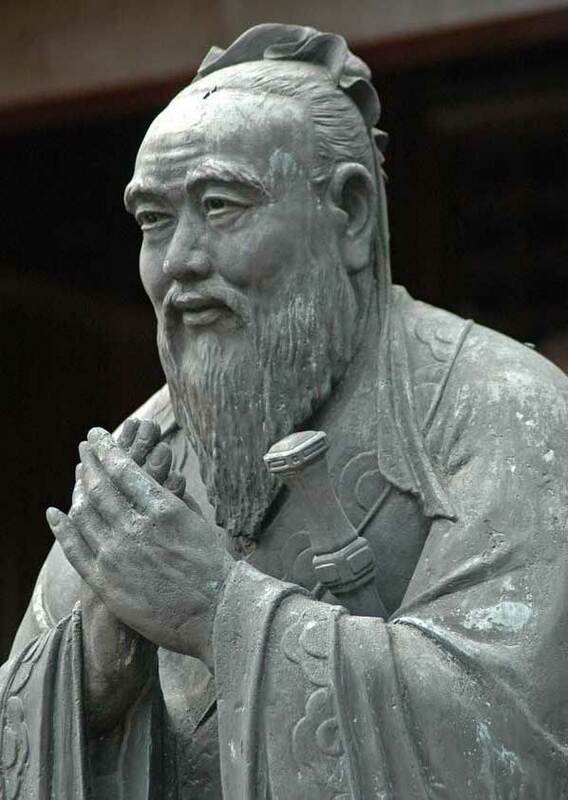 Confucianism is a set of ethical beliefs, sometimes called a religion, that were developed from the teachings of the scholar Confucius, who lived in the 6th century B.C. in China. His theories and philosophy gave rise to laws based on his teachings first in China, and then later in Japan, Korea and Vietnam. All who studied and practiced Confucianism aimed at harmonious relationships that would result in greater peace in their countries. Elements of Confucianism, though it is no longer widely practiced, persist in many Asian cultures. Like many of the great philosophers and religious leaders, Confucius did not keep records of his own words and deeds. Instead, the texts that make up Confucianism are recordings from his students, and their students. This is a bit complicated because many texts recording Confucian thought were burned during the Qin Dynasty. Dissenters of Confucianism were authorized to burn all materials in reference to it. Thus the records of Confucian thought are fragmented and sometimes contradict themselves or require explanation that is not given. Nevertheless, during the Han Dynasty, which lasted until about 220 A.D., Confucian thought was the inspiration for establishing the rules and laws of China. After the Han fell, Confucian thought was widely discarded in favor of Buddhism, but enjoyed a rebirth again in the 7th century. At that time, scholars blended ideas of Buddhism, Daoism and Confucian thought in order to create laws and emphasize the way right relationships can establish peace. The principal concepts in Confucianism were primarily meant to apply to rulers, nobility and scholars. Confucianism doesn't aim toward the general populace, as does Buddhism. The beginning of Confucianism is the idea that people must be virtuous, especially rulers. Self-virtue, expressed in modesty, truthfulness, loyalty, charity, and learning were essential requirements for all. The sum total of this social virtue is often referred to as the "Jen". They thought it was impossible to expect virtue and good living in most of the people governed, if the governors (or emperors) did not display the highest virtues, and did not promote the education of others to obtain these virtues. The Golden Rule arises in Confucianism: "What you do not want done to yourself, do not do to others." Emphasis is placed on virtuous relationship with others and acting "right" with all. Through virtuous behavior and observance of right relationships, harmony is established in the self and in the kingdom. Confucianism does include the concept of the divine and is expressed. Importance is placed on adherence to the traditional ways of doing things. He discussed at length the five important relationships. These are husband and wife, parent and child, elder and younger siblings or all younger people's relationship to elders, Ruler and Subject, and friend and friend. Of these, one of the most important relationships is still emphasized today in modern China, Japan and Korea. The relationship between parent/child is also called filial piety, the idea that children, even adult ones, must respect and obey their parents, and in general, their elders. This relationship is maintained in many households in Asian countries. Word of the parents is the law of the children when this relationship remains harmonious. Care of the parents as they age is another aspect of filial piety. There is consensus among scholars that, whether or not it is religious, Confucianism is definitively non-theistic. Confucianism is humanistic, and does not involve a belief in the supernatural or in a personal god. Ancestor worship – veneration of the deceased ancestors whose spirits are believed to control the fortunes of the descendants. Filial piety – devotion and obedience to and reverence of the elders of the family by the younger members. In Confucianism there is much to admire. It has taught a noble conception of the supreme Heaven-god. It has inculcated a remarkably high standard of morality. It has prompted, as far as it knew how, the refining influence of literary education and of polite conduct. The ethical system of Confucianism has much to commend it because virtue is always something highly desirable, both in an individual and a society. But it stands today encumbered with the serious defects that characterize the imperfect civilization of its early development. The association of T'ien with innumerable nature-spirits, spirits of sun, moon, and stars, of hills and fields and rivers, the superstitious use of divination by means of stalks and tortoise shells, and the crude notion that the higher spirits, together with the souls of the dead, are regaled by splendid banquets and food-offerings in Confucianism, cannot stand the test of intelligent modern criticism. Nor can a religion answer fully to the religious needs of the heart which withdraws from the active participation of the people the solemn worship of the deity, which has little use of prayer, which recognizes no such thing as grace, which has no definite teaching in regard to the future life. As a social system it has lifted the Chinese to an intermediate grade of culture, but has blocked for ages all further progress. In its rigid insistence on rites and customs that tend to perpetuate the patriarchal system with its attendant evils of polygamy and divorce, of excessive seclusion and repression of women, of an undue hampering of individual freedom, Confucianism stands in painful contrast with progressive Christian civilization. 2 Corinthians 4:3: "And if our gospel be hid, it is hid to them that are lost, in whom the god of this world [Satan] hath blinded the minds of unbelievers, that the light of the gospel of the glory of Christ, who is the image of God, should not shine unto them." All the people who die in cultures which have never been penetrated by the Gospel go to Hell for sins against the natural law and the other grave sins which they commit – which bad will and failure to cooperate with God's grace is the reason He does not reveal the Gospel to them. Romans 1:18-20: "For the wrath of God is revealed from Heaven against all ungodliness and injustice of those men that detain the truth of God in injustice: Because that which is known of God is manifest in them. For God hath manifested it to them. For the invisible things of him, from the creation of the world, are clearly seen, being understood by the things that are made; his eternal power also, and divinity: so that they are inexcusable." Although Confucius may have been a believer in Chinese folk religion and expressed belief in a supreme Heaven-god, Confucianism as an ideology is humanistic and non-theistic, and does not involve a belief in the supernatural or in a personal god. They are, as St. Paul says in verse 20, without excuse. St. Augustine explains this well in reference to persons who died ignorant of the Faith and without baptism. Everyone knows that God is not something that they have carved out of wood or jade or stone. They know that God is not the tree that they worship or the river they worship or the rock or the snake or the sacred tree frog or nature spirits. They know that these things aren't the Creator of the universe. Every such person knows that he is worshipping a creature rather than the Creator. If there were truly people of sincere and of good will who had not yet attained the faith, then God would send a preacher (even miraculously, if necessary) to bring the Catholic Faith and baptism to him. St. Thomas Aquinas, Sent. III, 25, Q. 2, A. 2, solute. 2: "If a man should have no one to instruct him, God will show him, unless he culpably wishes to remain where he is." St. Thomas Aquinas, Sent. II, 28, Q. 1, A. 4, ad 4: "If a man born among barbarian nations, does what he can, God Himself will show him what is necessary for salvation, either by inspiration or sending a teacher to him." St. Thomas Aquinas, De Veritate, 14, A. 11, ad 1: Objection: "It is possible that someone may be brought up in the forest, or among wolves; such a man cannot explicitly know anything about the faith. St. Thomas replies: It is the characteristic of Divine Providence to provide every man with what is necessary for salvation… provided on his part there is no hindrance. In the case of a man who seeks good and shuns evil, by the leading of natural reason, God would either reveal to him through internal inspiration what had to be believed, or would send some preacher of the faith to him…"
"It is in accord with God's justice that entry into heaven must be gained through steadfast faith, rational hope, and fervent love. A person ponders more frequently and adores more lovingly that which the heart loves more and loves with greater fervor. So it is with the gods that are placed in temples - though they are not gods nor creators, since there is but one sole creator, I myself, God, Father, Son, and Holy Spirit. But the owners of temples and people in general love the gods more than they love me, seeking to achieve worldly success rather than to live with me. "Faced with what is right, to leave it undone shows a lack of courage." "Go before the people with your example, and be laborious in their affairs." "Heaven means to be one with God." "I hear, I know. I see, I remember. I do, I understand." "I want you to be everything that's you, deep at the center of your being." "I will not be concerned at other men's not knowing me; I will be concerned at my own want of ability." "If I am walking with two other men, each of them will serve as my teacher. I will pick out the good points of the one and imitate them, and the bad points of the other and correct them in myself." That Confucius possessed a noble, commanding personality, there can be little doubt. It is shown by his recorded traits of character, by his lofty moral teachings, by the high-minded men that he trained to continue his life-work. In their enthusiastic love and admiration, they declared him the "greatest of men", the "sage without flaw", the "perfect man". That he himself did not make any pretension to possess virtue and wisdom in their fullness is shown by his own recorded sayings. He was conscious of his shortcomings, and this consciousness he made no attempt to keep concealed. But of his love of virtue and wisdom there can be no question. He is described in "Analects", VII, 18, as one "who in the eager pursuit of knowledge, forgot his food, and in the joy of attaining to it forgot his sorrow". Whatever in the traditional records of the past, whether history, lyric poems, or rites and ceremonies, was edifying and conducive to virtue, he sought out with untiring zeal and made known to his disciples. He was a man of affectionate nature, sympathetic, and most considerate towards others. He loved his worthy disciples dearly, and won in turn their undying devotion. He was modest and unaffected in his bearing, inclined to gravity, yet possessing a natural cheerfulness that rarely deserted him. Schooled to adversity from childhood, he learned to find contentment and serenity of mind even where ordinary comforts were lacking. He was very fond of vocal and instrumental music, and often sang, accompanying his voice with the lute. "It is not allowed to affirm that Confucius was saved." Condemned Error or Statement: “Good hope at least is to be entertained of the eternal salvation of all those who are not at all in the true Church of Christ.” —Encyclical "Quanto conficiamur," Aug. 10, 1863, etc. "It is not allowed to affirm that Confucius was saved. Christians, when interrogated, must answer that those who die as infidels are damned." "It is wrong to push our inquiries further than this."